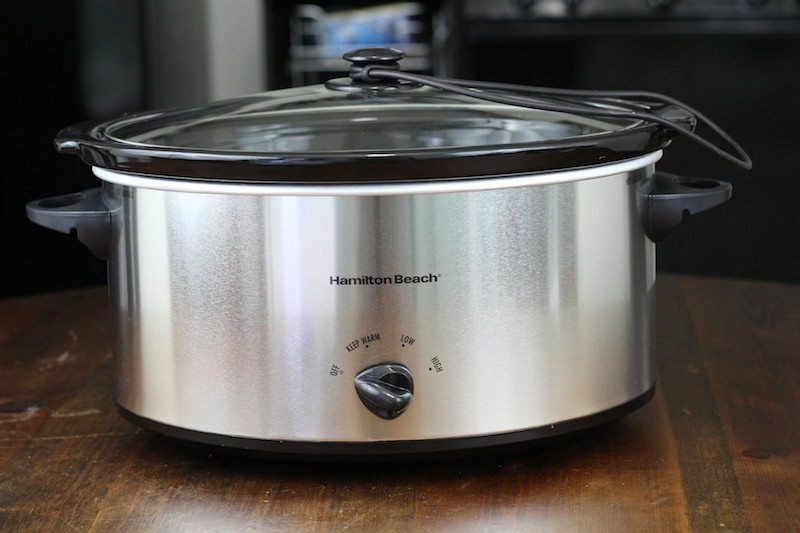 Somewhat related to this topic, we've also done a review of mini slow cookers worth checking out if you plant to do a buffet style dinner for the family, or serve sauces and dips at a pot luck. This is a huge list, and growing, so let me just say what my favorites are so you don't have to scroll through this whole list and read all the details. One of my favorites is the Frigidaire Stainless 7-Quart (no longer available)). It's not the biggest of the bunch, but it's the prettiest. If you want BIG, then get the Gourmia 8.5 Quart SlowSmart (no longer available). It's not as nice looking, but still does a pretty good job for being such a monster. 8.5 quarts is pretty much as big as this list gets. Beyond that, and you're looking at commercial equipment which is going to cost a pretty penny. Update 2017: Wow, I guess extra large slow cookers are not profitable, because a lot of them get discontinued. Over the past year, 3 of my top choices have become unavailable in many outlets. Regardless, I'm here to help. 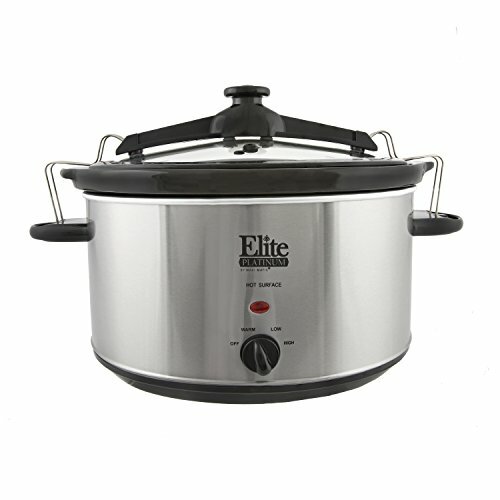 my new top choice is the Elite Platinum Digital 8.5 Quart Slow Cooker. With 51 reviews and Prime shipping, I doubt it will sell out any time soon, but I'll keep an eye on it. Let me know if it sells out and I'll continue to update this list with newer entries. Note: hover over links for current prices. 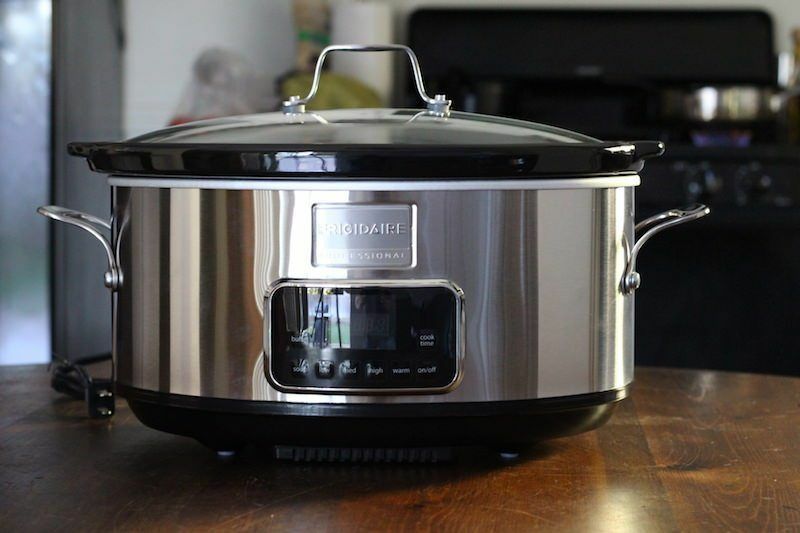 At 8.5 quarts, this slow cooker is certainly impressive in terms of size. It also has all of the features you would expect, including low, high and warm settings, along with an indicator light and a glass lid. For a manual slow cooker, that’s everything you need. It also comes from a good brand and Maxi-Matic has a large number of different slow cookers out there, many of which perform very well. This particular model also gets good reviews on Amazon and it’s one of the more popular large slow cookers out there. Not everybody agrees, of course, but for the price this is a good buy, especially given the selection of large slow cookers isn’t amazing. It also comes in silver, which I reviewed below. ==> Get It From Amazon Here! This model doesn’t have the indicator light that the previous one did but the rest of the functions are the same. This one does also tend to be much more popular on Amazon, averaging 4.3 stars across 735 reviews. Hamilton Beach is also an appealing brand in its own right, which may be another reason to pick this particular model. The price is also pretty good and you won’t find many slow cookers that are less expensive unless you look for smaller options. 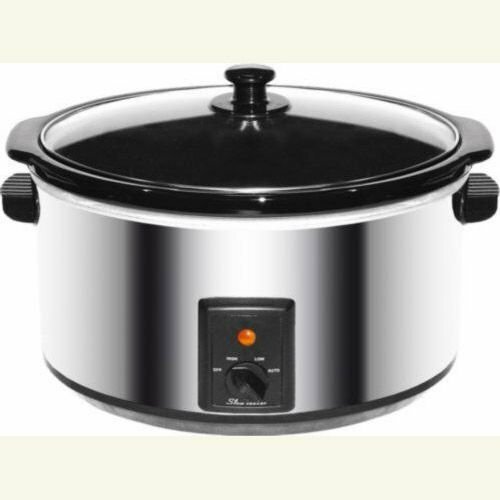 It seems impossible to have a list of slow cookers without at least one entry from Crock-Pot itself and this is the company’s 8-quart model. There is also a stainless steel version, which seems to be exactly the same except for the color and the price. Personally, I actually like the black one better and it is a few dollars cheaper as well. 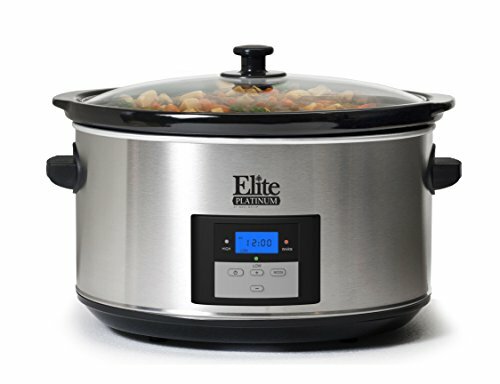 The average rating for this model is actually higher than the previous slow cooker (4.5 stars). However, this one is nowhere near as popular and just has 44 reviews on Amazon. For the most part though, the two models are pretty similar, so you could really go with either. This is actually a second model from Maxi-Matic, although it comes from a different line in their company. This model has a locking lid, and is another option, especially if you like Maxi-Matic as a brand. Brentwood Appliances is a more obscure option, which may be why this model has relatively few reviews on Amazon. Still, it comes in at a reasonable price and looks elegant as well. It’s hard to tell from the image but this model may actually be a round slow cooker, as opposed to an oval one. That’s pretty unusual for a slow cooker this large and may be a reason for buying it. However, beyond that, this model is pretty much the same as the others that we’ve mentioned, just from a less popular brand. 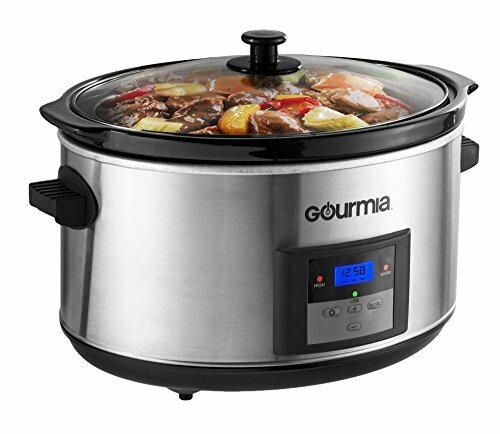 A manual slow cooker from Gourmia with a capacity of 8.5 quarts. One interesting feature is “auto”. It's unclear what this feature does though. One commenter said that it thaws frozen meat on high, then automatically switches to low to cook. Another person said that it cooks the meall, then automatically switches to warm. There's no question answered on Amazon that addresses this feature and it's not listed in the listing. Other than that, it's a pretty basic slow cooker but a very large size! This model is incredibly unusual. It isn’t a conventional slow cooker by any means. In fact, it isn’t even electric. Instead, you bring food to boil over the stove using the inner pot. Then, the pot is placed inside the outer container, which acts as a vacuum cooker. There are also various layers of insulation to add. The end result is that your food will slow cook for up to six hours while staying at safe temperatures throughout. The product is surprisingly easy to clean and to use, once you get used to it. Additionally, the slow cooker stays cool to the touch, so you can move it as you please. Needless to say, the slow cooker isn’t going to work in many situations, especially as it involves extra work and may require you to tweak recipes. Plus, it’s fairly expensive. But, it’s an innovative approach to cooking that allows you to start the cooking process and then lets you take the food with you, even as it continues to cook. Wow, that's a mouthful, but it's worth it because it really describes what you are getting with this appliance. It's got a 7 quart capacity, so it's not as big as the 8.5 quart models on this page, but it still cooks a lot of food. Plus, it's got a really unique and modern design compared to any other models out there. Most of the extra large slow cookers on this page look like their design team took a nap during production. Ugly! But this beautiful beast is one of my all-time favorites for large slow cookers. I even bought it and wrote a full review you can click to below! This is another big-boy I bought, and it absolutely exceeded my expectations. Although it's not quite as sleek as the Frigidaire featured above, it still does a great job in the looks department for being a whole 20% larger. In fact, you won't find many home-use slow cookers that are bigger than this. 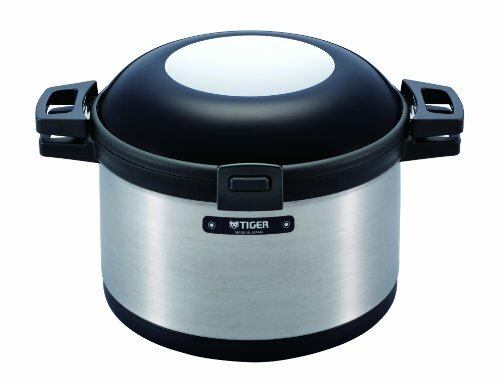 It even made my Top 3 list for large mid-price slow cookers. You can see the other two on the list by clicking over to the full review below. At 8.5 quarts, this particular model does offer considerable space for your meals and is easy to use. If “the biggest” is what you want and you want to get a programmable model, this is the one to get. This is another option for a digital slow cooker. Although, to be honest, it actually looks like a rebranded version of the previous model. In fact, the price and size are the same, plus the panel has the identical layout. Of the two, this one has a better average rating, although it also has fewer reviews. I guess this means that you could go with either model but it sounds like you’d basically get the same overall product either way. Regardless, the model has a good combination of features and the price is appealing for a digital slow cooker. The one other digital slow cooker that I found was this one here. It is more expensive and, to be honest, the brand is fairly obscure. But, it may be an interesting choice because of the locking lid feature. 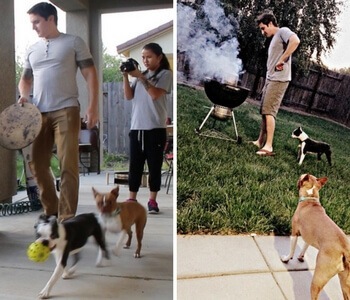 Being able to do this would make it much harder to knock the slow cooker over. In most cases, a locking lid is used if you want to transport the slow cooker with food inside. But, I honestly don’t think you’d want to do that with an 8-quart slow cooker. It would probably be far too heavy, especially if it was filled with food. The combination of functions for this slow cooker is a little bit unusual. 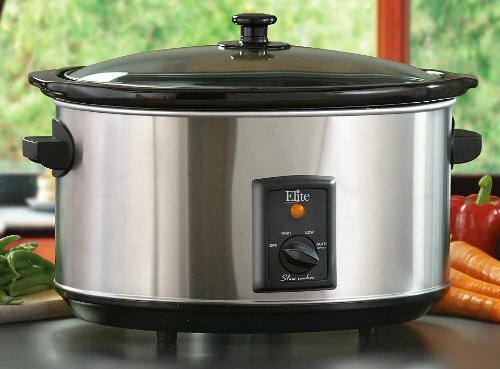 Basically, the product is a slow cooker but it also doubles as a way to roast and bake food. The reason for this seems to be mostly due to the temperature settings. So, instead of your normal low and high, this model lets you select what temperature you want, ranging from 150°F to 450°F. The plus side is that you certainly have more cooking options with this model than with a conventional slow cooker. Additionally, you can end up with crisp skin on roasts, something you cannot achieve normally. Nevertheless, the design would mean that you have to tweak slow cooker recipes to make them work and some may not be a good fit. Additionally, the shape would work better for some dishes than for others. 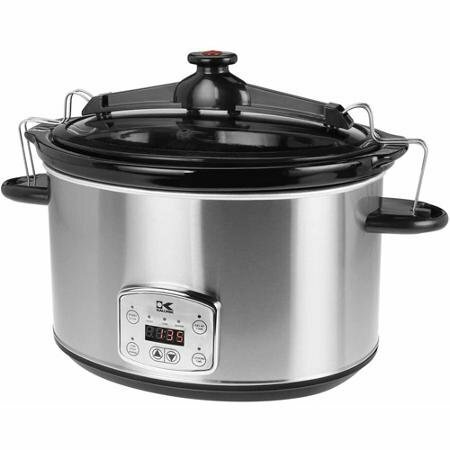 This is the largest slow cooker on our list and it’s pretty unusual to find one that goes all the way up to 9 quarts. The model offers six different temperature settings and the heating base has a quick-clean coating as well, allowing it to be used as a griddle independently. This majorly increases how much you can do and is great for saving cupboard space. 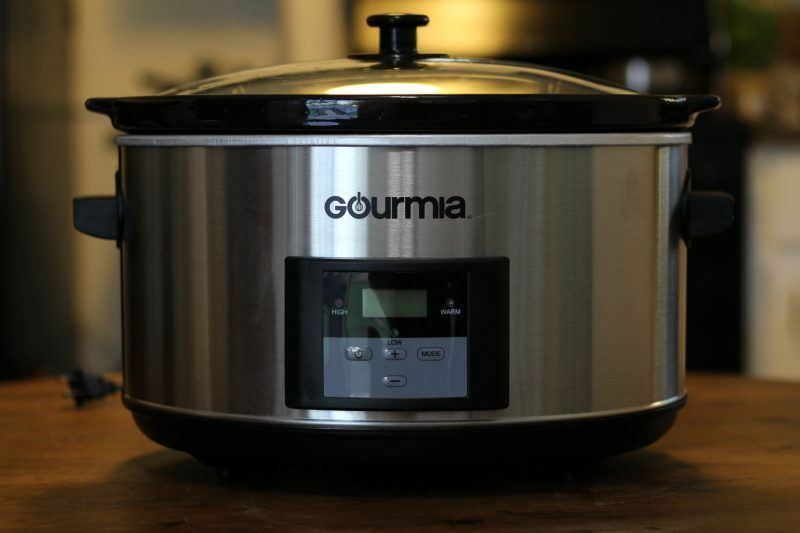 Reviews for the product are mixed, with some finding that the temperature settings are perfect, while others say that the slow cooker gets too hot. As such, it may not be suitable for delicate recipes but the size and the griddle aspect may still make it a good choice. There are a lot of multi cookers on the market, far more than we’ve covering in this list. 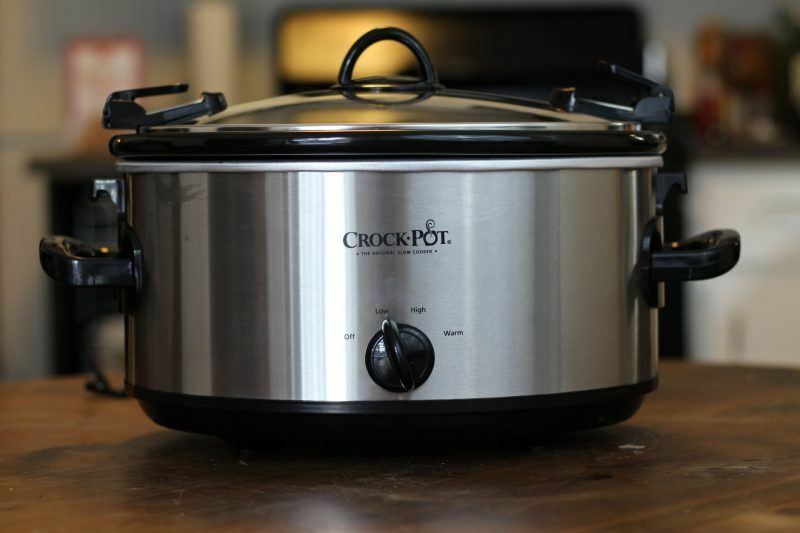 Many of them do have the slow cooker function along with a range of other options. Typically, this type of device will be more expensive than a slow cooker but essentially replaces multiple tools in the kitchen. This can make it a good investment, especially if you’re limited in counter space. This particular model receives good reviews and it also comes in a variety of colors and sizes. 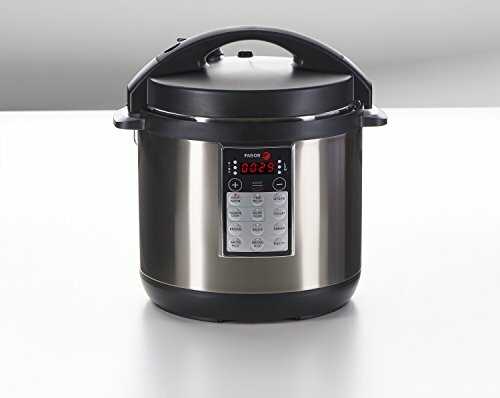 In addition to slow cooking, the device acts as a yogurt maker, rice cooker and pressure cooker, while also having a few other specialized functions, like the ability to brown food and sauté. 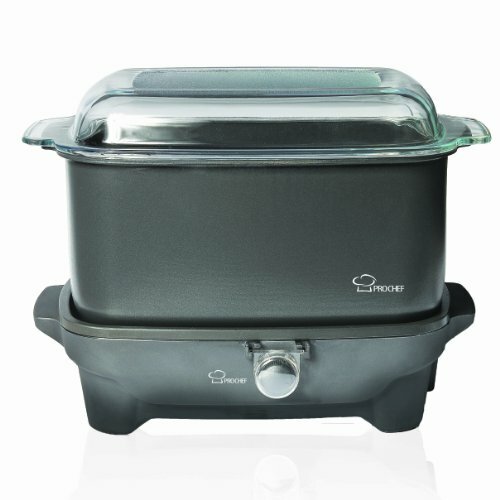 This model is another option if you’re interested in the idea of a multi cooker. 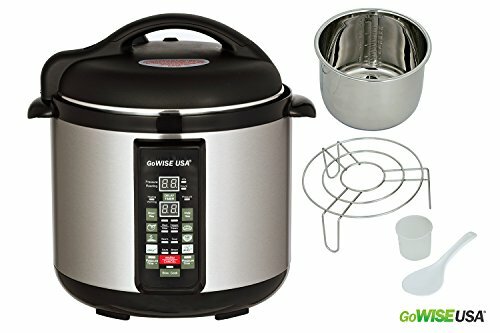 Like the previous one, the item is actually a pressure cooker but it comes with a wide range of different functions, including rice cooking, slow cooking, steaming and browning food. There is also an automatic keep warm function, like you would find in a digital slow cooker. The reviews for this model aren’t as good as for the Fagor version and the panel does look a little bit harder to navigate as well. Nevertheless, this is a cheaper option, which may be one reason to try it out. There are also many other multi cooker models out there. Most of them do have the slow cooker functionality, partly because it seems to be easy to include. In this list, we’ve only focused on models that are specifically marketed as slow cookers and there aren’t that many of those. However, if you are looking for a device with a lot of options, multi cookers are a good way to go, especially if you’re also considering trying out pressure cooking.